Visitors to Savannah are enchanted by the city’s historic squares, streets, buildings, and people. Most spend their time in our city in the Historic District, and there’s tons to see and do. But just a few miles south of the Savannah Historic District, is a cozy, uncrowded jewel to be found. It might be true that French Huguenots fled to safety from persecution to Isle of Hope. History is vague on the matter, but old maps of the Savannah area label the island L’Isle d’Esperance, French for Isle of Hope. Surrounded by water on all sides at high tide, today Isle of Hope is populated by a scant 2,400 lucky residents. 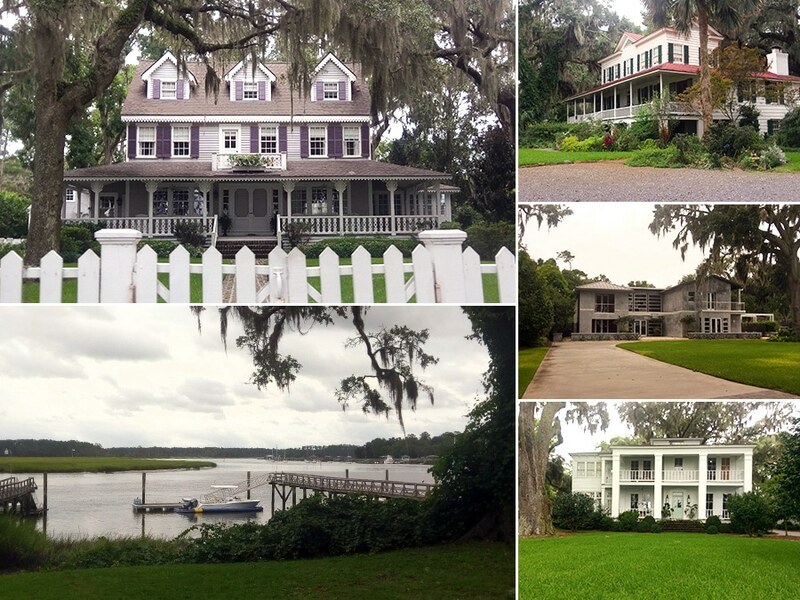 Some of the most beautiful homes in Savannah can be found on Isle of Hope, and you’ll be hard pressed to find a corner of the island that isn’t scenic. 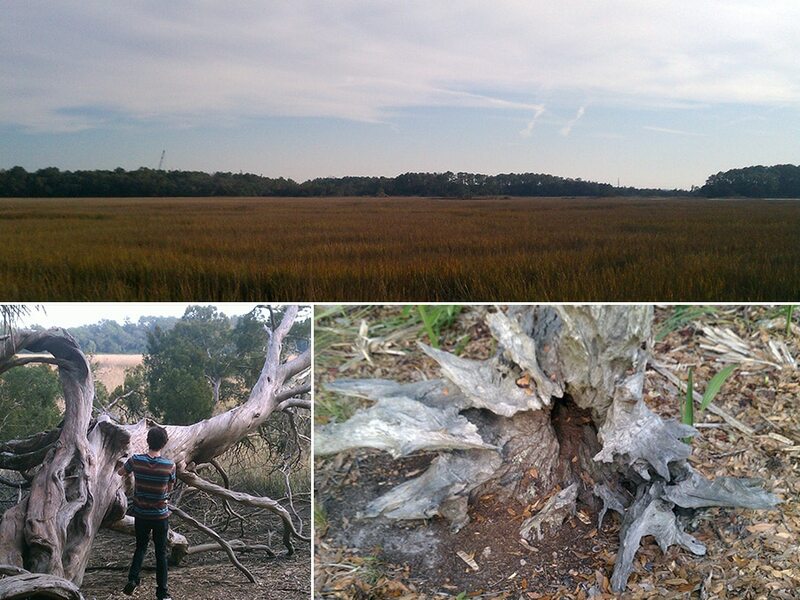 Savannah doesn’t have many intact plantations for visitors to enjoy like those found in our sister city of Charleston. Greenwich Plantation was destroyed by a fire in the 1920’s. Lebanon Plantation is a private estate. Isle of Hope is home to Wormsloe Plantation, the colonial estate of one of Savannah’s founding fathers. 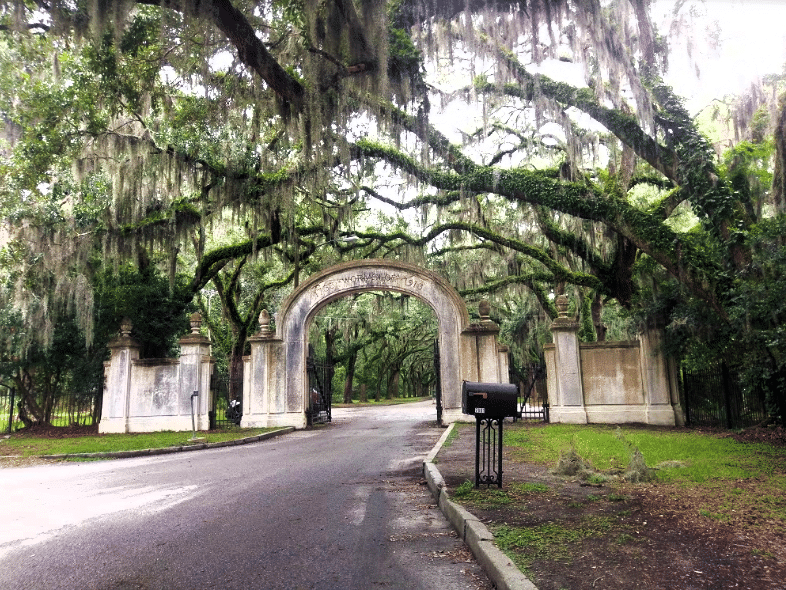 The one-and-a-half mile oak lined driveway and splendid 822 acres is worth the short drive to Isle of Hope from the city. When Gen. James Edward Oglethorpe came to the New World to found the colony of Georgia, he brought with him 114 men women and children. Among the passengers of the ship, Anne, was Noble Jones, a commoner and a carpenter. Packed in with sheep, pigs, dogs and other animals, Noble and the others suffered 88 days of travel to reach Charleston on January 14, 1733. The ship stayed in Charleston only a day, and headed south, to Port Royal (Beaufort, SC), the southernmost outpost in South Carolina. In Port Royal, Oglethorpe wisely sought audience with the neighbors, the Yamacraw Indians, and their chief, Tomochichi. A lasting friendship between Tomochichi and Olgethorpe came from the meeting, and the Anne was allowed passage to Yamacraw Bluff, where Savannah was founded. Noble Jones, the carpenter, and James Oglethorpe, Trustee and personal friend of King George II, became friends as well. Though he did not plan to live in the colony for long, Noble Jones would fall in love with Savannah. He was promoted to be Oglethorpe’s Surveyor, and designed Augusta, GA in 1735. Jones later served as a doctor, a constable, and as Royal Councilor. He became so trusted by Oglethorpe, that he was commissioned as “Agent for the Indians” including Tomochichi. The lifelong friendship between Jones and Oglethorpe was further cemented in the late 1730’s. Oglethorpe had returned from England with troops to attack the Spanish fortress at St. Augustine. Noble Jones commanded Georgia’s Northern Company of Marines, part of Oglethorpe’s 42nd Regiment. In 1736, Jones was granted 500 acres of land, which he called ‘Wormsloe’, possibly because of the silkworms in the mulberry trees grown on the property. On the southern tip of Wormsloe, he built his house, a fortified structure looking out over the “Skidaway Narrows”, to defend the strategic section of the Skidaway River from Spanish invasion. Using the resources available, the clever Jones constructed the fort/house from tabby, which is made by burning oyster shells to make lime, then combining it with water, ash, sand, and more oyster shells. You can visit what’s left of the house, which is the oldest standing structure in Savannah, at Wormsloe Historic Site. While you’re there, visit the museum showcasing relics and artifacts unearthed at the site. If you’re up to it, take a walk through the nature trail along the river, and ask questions of the period-costumed employees. Wormsloe Historic Site puts on several events throughout the year. Coming up soon is the “Tools and Skills that Built a Colony” event, taking place over Labor Day Weekend. Leaving Wormsloe under the 1.5 mile canopy of oak trees, turn right out of the driveway, for a short visit to what may be the most beautiful hidden corner of Savannah and Chatham County: Bluff Drive. Typing “W Bluff Drive” into your GPS takes you to the midpoint of the road. To see everything and get the whole experience, go to the end of Laroche Ave, take a right, and in two minutes or so, you’ll see what looks like a dead-end, but follow the large → arrow sign around the corner. Get ready to gasp, because the view is breathtaking and a real surprise if you’ve never seen it. It’s hard to remember that you are so near a busy city in the present. The feeling you get from the area is like going back 50+ years in a quaint riverside community. On one side of the street is the bend of the Skidaway River and lots of individual docks, with their boathouses. On the other side of West Bluff Drive, you see gorgeous homes; true southern mansions. Plantation-like in Greek Revival, Georgian, Colonial, and just about anything else you can think of. For the most part, every house has a differently-styled white picket fence out front, protecting the borders of the over-sized, mature yards. Each house and yard is different in size and design, but they are all in excellent repair, and the properties rarely change ownership. 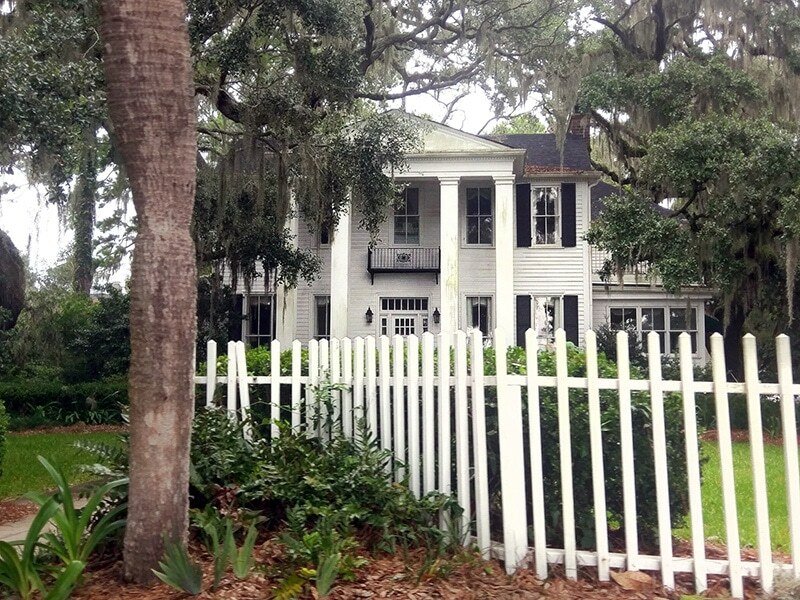 If you like looking at houses more than you like bar hopping or ‘people watching’, a stroll of the Bluff Drive area of Isle of Hope will be exactly what you are looking for. Named for the gnat that lived there first, on the edge of Isle of Hope, you’ll find a little area called Sandfly, Sandfly Community, or just Sand Fly. No one is really certain of the actual boundaries of Sandfly, because it was never “founded”, planned, or laid out. Sandfly just…happened. Slaves who were freed -or became free- from Wormsloe Plantation, or nearby Modena Island came to the little area due to it’s proximity to their old lives. They stayed because of the natural beauty and the peaceful life offered by the rural area so close to the city. The residents of Sandfly are the descendants of the freed slaves, many who have inherited lands passed down from generation to generation all the way back to emancipation. A middle-class community with old-fashioned, neighborly values, Sandfly, and nearby Pin Point, are significant to African-American cultural heritage. Savannah Dream Vacations is pleased to offer not one, but two vacation rentals on Isle of Hope in Savannah, Georgia. Jacquelyn Dr on Isle of Hope has 3 bedrooms and 2 baths, and features a screened-in outdoor bar area with billiard table. Or stay at the Modern Island Retreat, a 3000+ square foot, 4 bedroom, 3 bath home with chef’s kitchen, private back yard, and two car garage in one of the most desirable neighborhoods in Isle of Hope. Both houses are just 12 minutes to River Street, scant minutes to Wormsloe Plantation, restaurants, and super close to West Bluff Dr. When you book with Savannah Dream Vacations, your Savannah vacation rental home is a part of your Savannah or Isle of Hope experience, not just a place to throw your bags and be cooped up in a hotel room all night. We’re all locals at Savannah Dream Vacations, and we’re always available to help if something goes wrong, or to give you a local’s expertise on the Savannah area. Ready for your Savannah Dream Vacation? Call us, Contact us, or book now. Located just 12 minutes from River Street in Savannah’s most beautiful outlying area, the Historic Isle of Hope, this 3 bed, 2 bath retreat is a gorgeous home that provides the perfect opportunity to relax like a local. Gorgeous 3000sqf +, breezy modern 4 BR home on the most desirable part of the isle of Hope. Enjoy Marsh views from your bedroom. Perfect for family with kids that want to be in a safe are where the kids can run on the street.